August 8,1974: it's been 40 years since Richard Nixon was driven from office in disgrace, and rightly so. He didn't go because the system "worked," as revisionist history says now. He went because it became necessary to preserve appearance of legitimacy for a system which represented to billions of people the unjust Vietnam War; Cointelpro spying and assasination programs; the beating and killing of protesters at Jackson State & Kent State. Nixon's impeachment brought a slew of new politicians into Congress, passing some reforms which limited state surveillance. Nevertheless, it fell to the Democrats to abolish welfare and deport more immigrants. If you ask me, the system is still not legitimate. 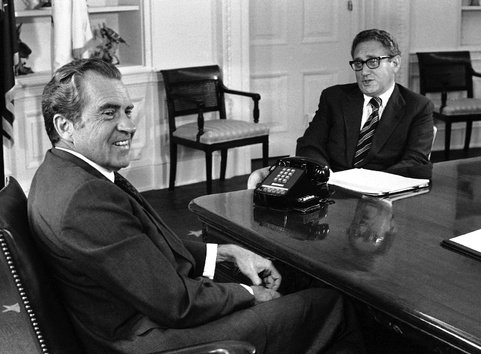 Photo, left: was this the day Henry Kissinger proposed, reportedly for the fourth time, the use of nuclear weapons against North Vietnam? August 6, 2005: Nine years ago, Camp Casey was born by a ditch near Crawford, TX, thanks to the determination of Cindy Sheehan to get answers from GW Bush on why her son was killed in Iraq. Cindy Sheehan posted a thoughtful reflection on how and why it happened. It's really worth reading and thinking about. 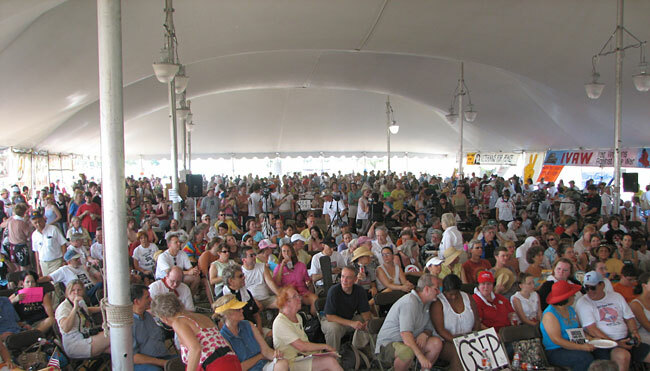 Photo, above: Hundreds of people gather at Camp Casey II for a rally in 2005.